Hoffman, from Allentown, Pa., had served as a Marine Corps artilleryman for four years before being deployed to Iraq with the 1st Marine Division in February 2003. He returned home that August with an honorable discharge. He spoke out publicly against the war for the first time on Veterans Day 2003. 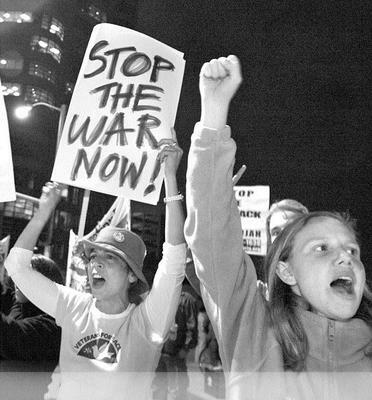 IVAW was formally launched in July 2004 during the national convention of Veterans for Peace. A group of leading public health doctors is demanding an independent investigation of Iraqi civilian deaths from the U.S. war and occupation, calling the Iraqi health ministry’s figure of 3,853 deaths and 15,517 injuries a gross underestimate. Last October, a group of epidemiologists estimated the real civilian toll in Iraq as at least 100,000 dead. The Bush administration and Britain’s government led by Prime Minister Tony Blair insist they have no legal responsibility under the Geneva Conventions to count civilian casualties. At a workshop on the national budget and the impact on local communities, during the UFPJ National Assembly, National Priorities Project Executive Director Greg Speeter put forward a striking comparison: If the Bush administration’s $82 billion supplemental request passes, total spending for the Iraq war will top $200 billion — enough to rebuild every school in the U.S. one and one-half times over. The enormous disparity between military and social spending was discussed in many contexts throughout the three-day assembly, and led to adoption of a community-based education and direct action project, “Highlighting the Local Costs of the War,” as a priority program for the next 18 months. The National Priorities Project provides information on the impacts of federal tax and spending policies at the community level. Its latest compilations detail the impact of Iraq war spending on states and local communities. For example, $17.7 billion of New York state’s federal tax money goes to feed the war machine. The share of impoverished Hartford, Conn., is $82.2 million, and tiny Willits, Calif. (population about 5,000), $2.2 million. NPP has the data to help community organizations determine where federal tax money from their cities and towns is going, and how reorienting national spending priorities could satisfy community needs such as housing, health care, education and transportation. Their web site is www.nationalpriorities.org. Hoffman told the story of Jeffrey Lucey, a Marine from Massachusetts, who returned suffering from nightmares, flashbacks, paranoia and alcoholism. His family took Lucey to a Veterans Administration hospital, which discharged him a few days later. Lucey committed suicide soon afterward. The VA later acknowledged to the family that they had found the young man suffered from post-traumatic stress disorder (PTSD) and had suicidal thoughts. Lucey’s family is active in Military Families Speak Out. IVAW welcomes anyone who has served in the military, whether on active duty, in the National Guard or in the reserve, since Sept. 11, 2001. The organization guarantees confidentiality to currently serving military personnel. Contact www.ivaw.net for more information. Denise Thomas, of Atlanta, who was elected to the UFPJ Steering Committee during the Assembly, has taken up another aspect of the cause — fair treatment for medically unfit soldiers. “When I started out, my daughter was in Iraq, where she spent a year,” Thomas said. “She was medically unfit” — suffering from severe scoliosis that had been treated during childhood but had recurred — “and she had serious pain in her spine.” Though Army doctors pronounced her undeployable, Thomas’ daughter was sent to Iraq anyway. “So I thought that was dangerous for her and dangerous for any other soldiers who might be around her,” Thomas said. Then, during the 2004 Martin Luther King Day march, she met some members of the Georgia Peace and Justice Coalition. “I’ve been a member ever since,” she said. Thomas’ web site, www.orgsites.com/ga/save-our-soldiers, tells the story of her campaign. Her daughter’s situation is detailed there, along with the plight of a male soldier with high blood pressure and that of a female soldier who had just had a hysterectomy — both sent to Iraq while obviously unfit for service. The site, which invites visitors to submit their own accounts, with or without names, also features a success story: that of Brandie Lampin, whose husband, Sgt. Tony Lampin, was sent back to Iraq despite a permanently damaged knee that kept him from running or marching with field gear. The sequence ends with Brandie Lampin’s joyous response to word her husband would return from Iraq. Thomas is continuing the struggle with support from the Georgia Peace and Justice Coalition, from antiwar activists in other parts of the country who help keep up the web site, and from Rep. Cynthia McKinney of Georgia, who was re-elected to Congress last November. Another newly elected UFPJ Steering Committee member is Fernando Suarez del Solar, whose 20-year-old son, Marine Lance Cpl. Jesus Alberto Suarez del Solar Navarro, died in Iraq in 2003. An active member of Military Families Speak Out and a founding member of Gold Star Families for Peace, Suarez has become a national and international spokesperson for military families with sons and daughters in Iraq and elsewhere around the globe. Fernando Suarez del Solar is the founder and director of the Guerrero Azteca Project, which was established in his son’s memory. The project, focused especially in Latino communities where large numbers of “green card” and “poverty draft” youth are entering military service, encourages young people to consider their choices carefully and to understand the full implications of military service. Most students pay close attention, Suarez said, and he has received some 2,000 letters from young people, thanking him and saying things like, “You changed my life, you opened my eyes.” He also receives calls from parents, thanking him for explaining the realities of military service to their sons and daughters. “When I go into a school, I insist on action from the students,” Suarez said. “I don’t say they have to join my group, but I call on them to form new groups and work against the military.” This has happened at a number of schools, he said, with parents also sometimes joining in. Proyecto Guerrero Azteca () is linking up with other antiwar efforts in schools, such as those of the National Network Opposing Militarization of Youth (NNOMY) and the American Friends Service Committee. To date, the San Diego, Calif.-based Suarez has made presentations in about 60 cities throughout the country, from New York to Washington state and Illinois to Texas, and has participated in several international conferences as well. These leaders, and all who participated in the National Assembly, share a commitment to keep youth from being sent to war, to bring our troops home as quickly as possible, and to build a society that supports its young people with democracy, equality, social and economic justice. Marilyn Bechtel (mbechtel @ pww.org) is a member of the editoral board of the People’s Weekly World.